I have read about Sheex before and was dying to try out of of their products. They make very high quality bed sheets and duvet covers. For my review, I was sent a mini travel pillow. As many of you may know, I live on the west side of the state in Michigan and my family lives on the complete east side. This is about 3 1/2 hours away which of course, results in a lot of driving. When my husband drives, I sometimes like to take a nap and this pillow is perfect for that. My favorite feature about this product is the feel of the material. 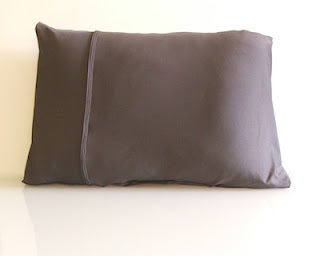 The Sheex on the pillow is so soft and stretchy. I love it! I chose a nice blue color which is relaxing. It is very comfortable and I can't wait to be able to take a little nap on it when we are driving one day soon. I would love to try an actual sheet set from Sheex and will maybe purchase one one day. For now, I will keep dreaming! For an unbelievable quality product, you definitely should try Sheex. I would recommend that travel pillow. It is a dream to lay your head on. I love it and I have it.